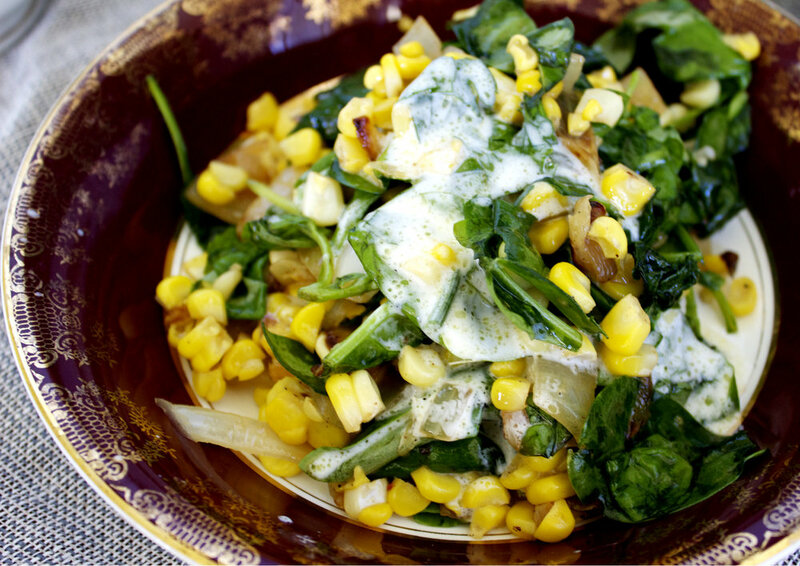 This week we have a Sweetcorn with basil yoghurt dressing recipe by Petite Kitchen. We are collaborating with Eleanor from with Petite Kitchen and posting one of her amazing recipes followed with nutritional benefits about the herb that the recipe contains. This week I will be posting a blog post on Basil and the benefits that it has on our health. Basil is a common herb used in cooking but many people aren't aware of how it can improve our health. Basil has been used for over 5000 years for its oils and extracts as they can have been known to have anti-inflammatory and antibacterial properties. The anti-inflammatory properties come from the eugenol, this is the volatile oil. This oil helps to block enzymes in the body that promote swelling helping treat inflammatory conditions such as arthritis and inflammatory bowel conditions. Basil leaves and basil oil have antibacterial properties, they can actually be used to clean surfaces of infectious disease. Basil leaves help with colds, flu's and fevers as it helps clear mucous. Add three leaves to a hot cup of water and drink as a tea. Basil is very low in calories and contains no cholesterol. It is a great source of nutrients, vitamins and minerals which are essential for health. Basil is high in vitamin A, through its concentration of carotenoids such as beta-carotene. Beta-carotene helps to protect our epithelial cells from anti-oxidant damage. Basil contains magnesium, this vitamin promotes cardiovascular health. It relaxes blood vessels, improves blood flow and also controls irregular heartbeats. Basil also contains vitamin K, Iron, Calcium, Potassium, Manganese, vitamin C and fibre. When buying basil try to buy fresh basil over the dried form since it has a stronger flavour. The basil leaves should be a deep green and have no dark spots or yellowing. Over the last couple of weeks, we have been gifted bags full of homegrown organic sweetcorn. I love eating the sweet juicy vegetable simply boiled then smothered in butter, but I decided it was time to try something a little different. This mouth watering corn salad is light and fresh, and has a lovely balance of flavors and textures. In a large saucepan of salted boiling water, simmer the corn until just cooked. Drain, then leave to cool. Slice the corn kernels off the cob, and transfer to a large bowl. In a large skillet on medium heat, melt the butter until sizzling. Add the diced onion, garlic, chili, and a pinch of salt and pepper. Saute until soft and slightly browned. Add to the corn along with the herbs and mix until combined. In a medium bowl, add the yoghurt, olive oil, parsley, lemon juice, and a pinch of salt and pepper. Using a spoon, mix well. Drizzle the yoghurt over the salad and serve. Serves 2 as a main, or 4 as a side.